No film star occupies as unique a place in popular culture as Nicolas Cage, the wild-eyed nephew of Francis Ford Coppola – and cousin of Sofia and Roman Coppola, and Jason Schwartzman – who bears a career of quite staggering versatility. In the 1980s he made his debut as a teen heart-throb in films like Fast Times at Ridgemont High and Valley Girl, before critical acclaim arrived in movies with the Coen Brothers, David Lynch, Martin Scorsese and his uncle (he won an Oscar for Leaving Las Vegas and was nominated for Adaptation) and a sharp left-turn into ever-more-ridiculous actioners – Con Air, Face/Off, National Treasure, Bangkok Dangerous – defined his later years. He's been in well over 80 films and is magnetic in each of them, so what better subject for Glasgow cult film club Matchbox Cinema's first festival? Organisers Megan Mitchell and Sean Welsh tell us what to expect. Why Nic Cage? What's so good – ironically or otherwise – about him, and why does he deserve his own festival? Megan Mitchell: Cage as a cultural icon is so huge now that it just seems right that he's honoured with his own festival. But not just 'internet meme Cage', we're looking at him through multiple lenses. 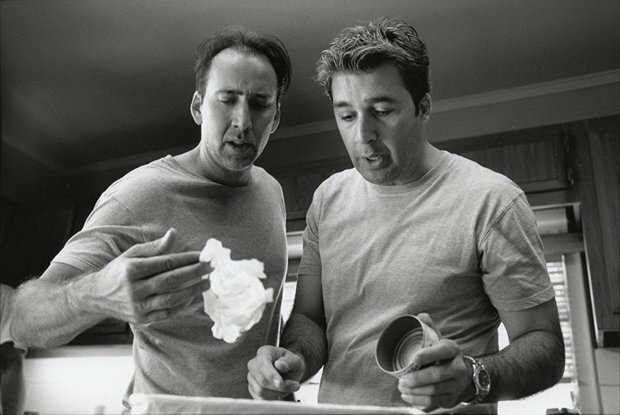 Saturday's 'Action star Cage' is a big, over-the-top hero who we can all enjoy, from the supreme weirdness of Face/Off to the almost parodic action man he plays in The Rock. Personally I'm looking forward to Sunday more, as I feel Moonstruck, Raising Arizona and especially Valley Girl showcase Cage as not just a good actor but also a diverse and under-appreciated romantic lead. What are his best qualities as an actor, and how do the films you've chosen illustrate this? Megan: For me, Valley Girl, his first film as Nicolas Cage (he was Nicolas Coppola in Fast Times) is just the ultimate Cage film. There are a few flying-off-the-handle Cage meltdown moments, but I think if more people saw this film they would really appreciate the subtleties as a performer. Sean Welsh: And his original teeth. For me, it's probably just his investment in whatever he does. He's self-aware without winking at the audience or tiresomely ironic. Some people say he's a bad actor, but I think that's extremely lazy criticism; he's wild at heart and weird on top, and that always shines through. But my very favourite Cage films aren't even in the line-up this year – we wanted to have a solid theme for each day and I've always wanted to show (Saturday's) Holy Trinity of The Rock, Face/Off and Con Air back-to-back. Sean: We have Cage-a-kucha early on Saturday, we're coordinating that with Claire Biddles, and later on Saturday we have Cage's official stand-in Marco Kyris, who worked with him for over a decade on most of his best-known films. Marco has recorded an introduction to Saturday's Holy Trinity, all of which he worked on, and will be joining us later that evening for a live Skype Q&A from Toronto. On Saturday and Sunday night, we've teamed with Nice 'n' Sleazy so our ticket holders can get in free to Glitterbang and Null/Void respectively, and we're sponsored by Williams Bros Brewery, so they'll be providing drinks on both days. For the breaks, we also have a huge collection of Cage trailers and clips with which to test the patience of the faithful. Megan: On Sunday we have a specially-recorded video lecture from Canadian Cage scholar Lindsay Gibb, who'll be schooling us on the acting technique Cage calls 'Nouveau Shamanic'. The foremost Nic Cage podcast, New Jersey's #CageClub, have recorded a special edition for Cage-A-Rama, which we'll also play on Sunday. There's more too, including one pretty amazing surprise that's still percolating, so we have to keep it to ourselves for now. He occupies a particular place in the public's affections, for the unique blend of quality films and dumb actioners he's been in. How do you think these two sides of him tie together, and help create a unique cinema star? How is the campaign to get him to attend the festival going? And will you be holding another and trying again if he doesn't come? How much potential is there to keep revisiting his career in future, and would you consider programming something similar for anyone else? Sean: It's going great – we've narrowed it down to just one remove from a couple of directions, so he's basically cornered at this point. But yes, we'll keep the firing burning for as long as it takes to #BringCage2Glasgow. I think there are other actors whose work justifies a dedicated festival – Meryl-palooza? KeanuCon? – but there are so many sides to the diamond that is Nic that an annual Cage-A-Rama could run literally forever. Megan: I will genuinely have a nervous breakdown if he comes. Cage-A-Rama is at the CCA, Glasgow, Sat 6 and Sun 7 Jan.
Scotland's second Nicolas Cage Film Festival takes place near the actor's birthday. The event is organised by Matchbox Cineclub, an independent cult film exhibitor based in Glasgow.